Well Rogers gold medal mission is underway and it's pretty clear from today that it's bound to be a roller coaster ride. Many thought Falla was going to be a walkover match for Roger, but like I said in my Olympic draw post this guy was always going to test Roger because he just has one of those games that can be awkward; even for the GOAT! In best of 3 set matches its always good to get out of the blocks quickly; in best of 3 matches on grass it's almost imperative and it was clear Roger knew that as he started off exceptionally well hitting a sweet half volley forehand down the line in his opening service game. It was actually a pretty comfortable first set for Roger, he served well, used a lot of variety, threw in the dropshot to keep Falla guessing and generally was able to get control in the majority of baseline exchanges. There were a couple of moments on his own serve where he was in a little trouble but he took it 6-3 to get off to a great start. After winning the first set playing some solid stuff it looked like Roger might be able to coast over the line and at 5-3 and 0-40 on the Falla serve it looked certain Roger was getting the job done in straights but Roger Relaxerer arrived on court and wasted 3 break points, failed to serve it out, wasted 3 more BP chances and lost serve again to drop the set 7-5. You can't really blame Roger for taking his foot off the gas here, with 3 match points on his opponents serve it looked like the match was a formality, it's clear his mind was already in the locker room but Falla is the kind of player that makes you win points and if you switch off, he's dangerous. I imagine wasting 3 match points and dropping his own serve happened in a flash really and almost shocked Fed to think that about 30 seconds ago he was practically putting his racket back in his bag which is probably the cause of the seemingly endless stream of unforced errors that flowed from his racket as he lost the second set 7-5. It was kinda awkward to watch as he capitulated at the end of the set but fair play to Falla, he was mixing things up, staying in the points and coming up with the goods when it mattered. Luckily for us though this is Roger 3.0 and he doesn't fold matches after a couple of bad games so even though he dropped the set you still had to give him the edge in the decider. After losing the second set despite having 3 match points Roger was able to regroup quickly and broke immediately at the start of the decider. I was pretty surprised when he was broken straight back but really it was credit to Falla, he almost looks like he shouldn't be out there, scruffily dressed, his shots aren't dazzling but he's very effective. He makes you win the point rather than give it away so you really can't let up at any point in the rally. His backhand that he almost hits inside out seems to cause Roger a fair few problems along with his cross court forehand that's also dangerous because he finds a lot of short angles with it. At 3-3 Roger fashioned a break and this time managed to consolidate to move 5-3 ahead. With Falla serving to stay in it Roger once again found break points and this time didn't let up as he took the match 6-3 7-5 6-3. It was probably a blessing that he didn't have to serve it out again as Falla was still in the match and tends to swing freely when he's got his back to the wall so sealing it with a double break was sweet! All of a sudden I missed the match points, things got difficult and he played a great match to come back, so I'm relieved of course. Falla is a great player, counter-punches well, plays really well and made things really difficult for me. Overall I think this was almost a dream first round match, it was a stern test but yet again Roger got over the line when it counted. Maybe after winning Wimbledon Roger was on cruise control, but this match kinda woke him up again and now he knows that he's going have to play some good stuff to win the gold. So it was the ideal start and now he can head into round 2 with even more confidence knowing he's seen off a player who is capable of causing him a lot of problems. I think Roger is giving Benneteau a beatdown here, he might have lost the first 2 sets at Wimbledon and had to dig himself out a hole but there's no way he's dropping a set this time around. I think Benneteau will remember their 5 setter at Wimbledon all too well, as will Roger and he never seems to play 2 shaky matches on the bounce so I believe it's au revoir Benneteau 6-2 6-2. I find it ridiculous they are talking about copyright violations. I mean, this is the Olympics for crying out loud! It’s not the EPL or the CL or MLB or NFL. This is a pure and simple celebration of athletes. The Olympics represent humanity. The BBC represents stupidity. Haha it’s just YouTube terms of service, I guess it’s because BBC and other worldwide channels paid a lot for the coverage so to have it ripped onto YouTube wouldn’t be fair. Relaxerer! LOL You really play well with words. Haha the trick is to add erer onto anything and it tends to work! Djokovic lost the first set only to come back and trounce Fognini. The first round for the top seeds are always a little shaky but we all that the farther Fed goes into a tournament, chances are, the better he gets. Not all the time but most of the time. The tv coverage of tennis in the olympics is minimal to none in the U.S. I am not really that excited about the whole thing maybe due to the lack of interest. Nonetheless, I hope Roger does well although it’s not really important since I am satisfied with everything he has done up to this point. If anyone else is wondering about coverage – if you Google around using a UK proxy you can stream from the BBC website, just remember to only click onto legitimate looking sites. Yeah I missed the Djoker match but heard he hit back pretty solidly after losing the first set. Guess the rain delay didn’t help when it was like 7-7 in the tie break when play was suspended. Nah I know what you mean, I like the fact it’s on grass but tennis at Olympics isn’t that good, it probably shouldn’t even be included, if mugs like Massu and Rosset can win golds then you know players don’t put a ton of emphasis on it. Thanks Susan, who would of thought that this would be on ” BRAVO”. I know, right. But Bravo to Bravo for picking it up. Cheers for the info Pat! Haha yeah, I should have put money on it! You were spot on about the score against Benneteau. It seems Fed whispered to you just before the match about the score. LOL! Though I am commenting in your blog for the first time, I have been following it for a while once I came to know about it from Ru-an’s blog. 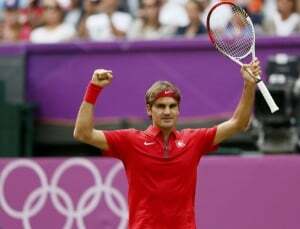 Keep up the good work and my best wishes, both to Fed and you. And thanks for commenting, glad you like the blog! Wow, that was a good prediction. Spot on with your Benneteau prediction!!! I know 😀 I thought it was gonna be a one sided thing and 2 & 2 seemed the most likely scoreline!